I have cited Alvah Hunter's book, "A Year on a Monitor and the Destruction of Fort Sumter," several times in the past few posts. I finished reading it and I highly recommend it if you have an interest in Civil War ironclads and naval warfare. While Hunter enlisted at age 16 and served as a cabin boy, he was a remarkable mature and curious young man. Unlike his shipmates that used their shore leave for drunken revelry that usually ended in fist fights and arrest, Hunter took the opportunity to visit various historic locations like Battery Wagner after it fell, a captured blockade runner and the captured CSS Atlanta. His curiosity took him on deck at the start of the engagement with the CSS Atlanta such that the first shot fired, missed his ship but thoroughly splashed him with water. He provides a lot of detail about the USS Nahant's, a sister of the USS Passaic, construction, operation, maintenance, problems they encountered and general life on board. He was present for several important battles including the failed April 1863 attack on Charleston, the capture of the CSS Atlanta - from which he received a $176 payment of prize money, the capture of Fort Wagner and several other minor engagements. He augments his personal observations with passages describing the Confederate viewpoint on the battles since he wrote the book about 50 years after the war. This helps keep the story aligned with the bigger picture. All in all a great little book. This past week Northern Virginia, as well as much of the US East coast, experienced a pair of natural disasters. Fortunately for us, the events did not cause much damage. We came through pretty much unscathed, with just some electrical power flickering but no serious power outage. Others were not so lucky, and there were several fatalities including a child killed in his bedroom by a falling tree. The earthquake at 5.8 Richter Scale strength was unnerving but did not cause much damage. Earthquakes are very rare in this part of the world. Hurricanes are not as rare. Hurricane Irene was at category 1 strength by the time it reached the Mid Atlantic Seaboard. In Alexandria we only received tropical storm winds. Trees down seem to be the biggest problem in my neighborhood, but there don't appear to be that many. Last summer we had a powerful localized thunderstorm that destroyed hundreds of old trees. That caused our power to go out for 24 hours. That storm may have acted like a natural pruning and left only healthy strong trees that were able to survive this storm. I need to add the cable stays to the stack. Work continued on the Passaic in between preparation for the storm and checking the weather. I added about 800 rivets to the hull armor plates. That was a tedious job without much visual payback. I didn't have a good reference shot of the armor plates, so I went with an educated guess. It is interesting that Alvah Hunter never refers to rivets when discussing the armor plate. He always uses the term "bolted." I wonder if he is being literal or if "bolted" was used synonymously with "riveted" in the 19th century. In photos they clearly look like rivets. I scratch built the smoke stack using sections of PVC pipe, a PVC coupling, strip styrene and rivets. Hunter mentions an armored grating on the top of the stack to prevent projectiles from entering, so I cut one on the laser and added it to the stack. I have a reference painting that shows cable stays on the stack. So I need to add them. The ship is so big that I cannot fit it in my spray booth to paint it. So I had to take it outside to paint. In the process of handling the hull with wet paint, I dropped it. That popped some of the armor panels and will require touch up putty and sanding. You can see some of the crack damage along the hull-deck edge in the photo. other details on the Catskill, a sister of Passaic. The Monitors were equipped with stanchions and rope railings for use when not in General Quarters. The stanchions were removable for combat. Alvah Hunter describes the stanchions as being 2.5 feet tall. I had ordered a batch of brass machined stanchions from Bluejacket models. The biggest ones they had were 7/16th inch, at nearly a dollar each they were expensive and alas too short. The photo above shows how I extended the stanchion with a short section of 1/16th inch thin walled brass tubing. They look like they should match the stanchions in the prototype photo at the left. The hole spacing should work as the rope lines were not evenly spaced on the stanchion. Also note the bell and davits detail in the prototype photo. I later discovered that Billings Boats has the multiple size stanchions. I'll see if I can order some of them, but I think the extended ones I have will work. I can also try laser cutting some as they do appear to have a flat profile in the photo. I found an interesting site about Dahlgren guns with neat 3d renderings of the gun in the Monitor turret. I added the side armor panels to the hull. By cutting the panels to the appropriate shape I was able to add the sheer curve to the hull. Sheer is the measure of longitudinal main deck curvature. Although the hull of an ironclad Monitor type hull looks like a flat raft, it actually has sheer and camber. My hull has both. I think it really helps the appearance of the hull, making it look much more like a ship. The Passaic Monitor class ships were designed to be trimmed with the bow higher than the stern. This allows water to drain through the bilge to the rear where pumps would eject it from the ship. The Nahant almost sank because the trim was off when they loaded too much ammuntion in the forward holds and some of the drain holes were plugged with construction debris. The Nahant's officers caught the problem in time to prevent sinking. Unfortunately, the USS Weehawken sank due to essentially the same problem, taking the lives of much of the crew. The side armor panels have engraved detail and a base coat of black primer. I probably need to add 3D rivets to the side panel, but there are so many.... The rivets on the deck surface were counter sunk and are fine as just engraved detail. Whew, thank goodness.. The ventilators are probably a bit large, but look cool. They were added later to the ships to improve airflow. They may have not been on the ship in December 1862. One of the things that gives the Union Monitor class ironclads their character is the distinctive tent awnings on top of the turrets. Since I can't sew, I had to come up with a different method to make the awning. I used my laser to cut a satin like fabric. I hoped that the laser would melt the cut lines and thereby avoid having to sew a hem. It worked. The fabric was "cauterized" by the laser. But what about the sheen of the satin? I used flat white primer to paint the fabric. That killed the sheen, but reduced the fabric's flexibility. I then crumpled the fabric in my hand to break up the stiffness of the paint. That worked pretty well. I then laser cut small rings that I glued to the fabric with CAA. I also glued the long seam to create the teepee. I used a pencil to simulate seams between the panels. Then it was a pretty simple matter of threading it on the davits. I made each segment longer than than the straight line distance between each davit so that fabric would drop slightly. Once I had it threaded, I soaked the fabric with water to help shape it better. Once the fabric dries, I'll weather the awning with chalks to represent the coal soot from the engines. 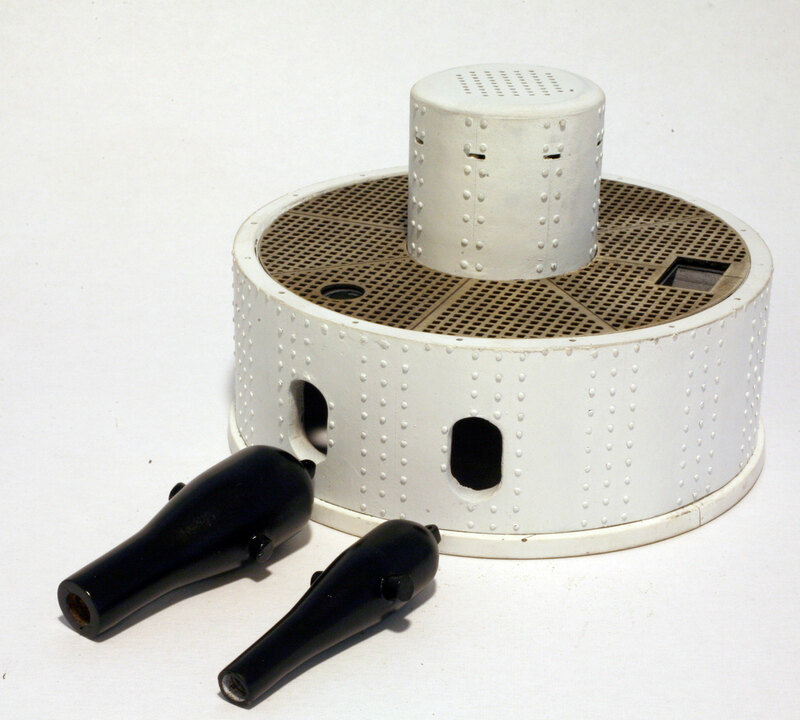 The turret was the major challenge on this model, especially after deciding to detail the interior. With the awning on, you really can't see in the interior very well. But it was fun to make and the turret comes off if you really want to see the guns. 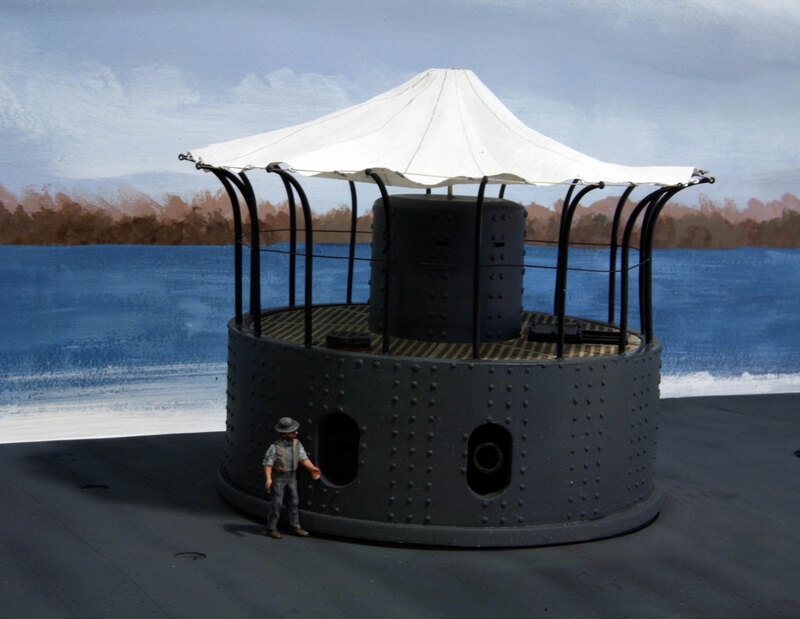 There are still a few details left for the turret including a flagpole and some ladders. The rest of the hull should be pretty straight forward to finish except for the sheer. I had an idea on a method to simulate the sheer (i.e. the hull's upwards slope as it approaches the bow.) The sheer is only about a 1/4 inch over 50 inches, but it is noticeable. I'll try that next. I think I had a few too many paint fumes, but the turret is almost done. are visible in this shot. On March 9, 1862 Gustavis V. Fox, Assistant Secretary of the Navy and Lt. Henry A. Wise, Bureau of Ordnance, watched the encounter between Monitor and Merrimack from a small tugboat in Hampton Roads. 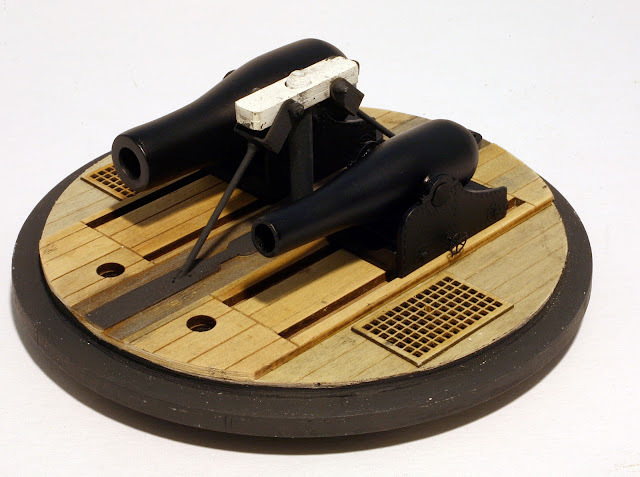 Although MONITOR was left in possession of the battleground, neither contestant had been materially injured and it was apparent that something more powerful than Monitor's 11-inch Dahlgren shell guns  was required. Coming ashore at Fort Monroe, Fox was attracted by an experimental 15-inch Rodman columbiad lying nearby. 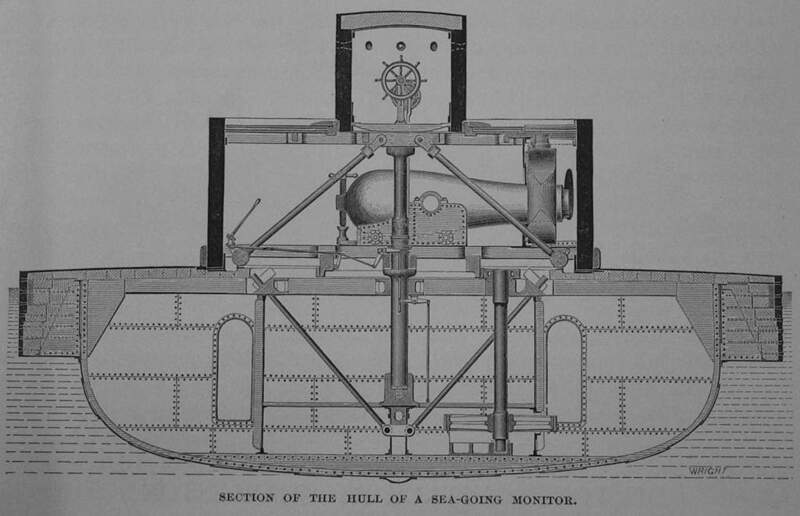 This obviously was the needed gun.Therefore, in April, Dahlgren completed a 15-inch design to fit the 20-foot interior of the new Ericsson ironclads. The first 15-inch guns weremounted alongside 11-inch shell guns since the 15-inch guns could not be produced quickly enough to provide two for each turret. The carriages were made of iron and the gun ports were so small that the 26.5-inch muzzles could not protrude. Consequently, a smoke-box was devised as shown in the illustration to protect the gun crew from the blast of the explosion. 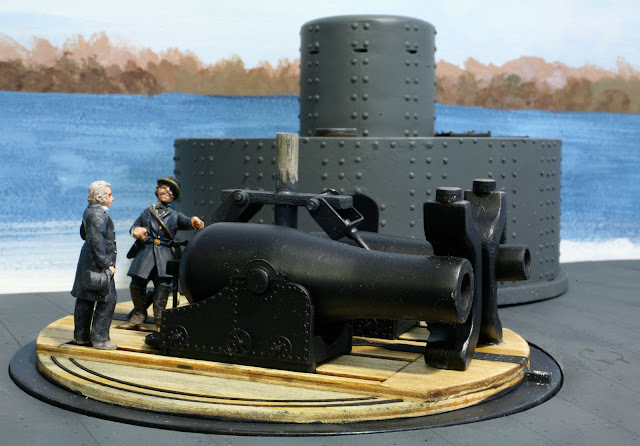 Early testing was carried out in attacks on Fort McAllister, Ga. On January 27, 1863, Commander John Worden, of Monitor fame, and now captain of the new Montauk, fired twenty-six 15-inch projectiles at the fort from a range of 1,600 yards. "The firing from turret seemed slow and deliberate to those in engine room; the smoke from guns was forced rapidly into fireroom at each discharge, but was well diluted with air by the fans, and rapidly passed out through furnaces and smokepipe, causing no unusual discomfort." 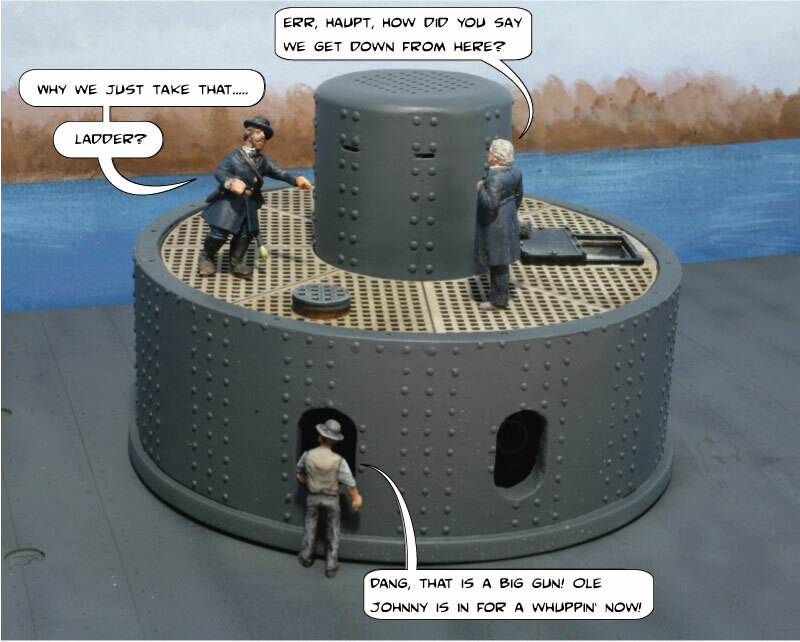 Rear Admiral DuPont commented, "We have obtained valuable information in the success of the working of the XV-inch gun . . . My own previous impressions of these vessels . . . have been confirmed, viz., that whatever degree of impenetrability they might have, there was no corresponding quality of aggression or destructiveness as against forts, the slowness of fire giving full time for the gunners in the fort to take shelter in the bombproofs." On February 28, Worden first proved the effectiveness of the 15-inch guns by destroying Confederate steamer Nashville lying aground under the protection of Fort McAllister. The range to the steamer was approximately 1,200 yards; only eight 15-inch shells and six 11-inch shells were required to set the wooden ship afire. Average time for firing the 15-inch gun was a little over 6 minutes with a minimum time of 3 minutes. 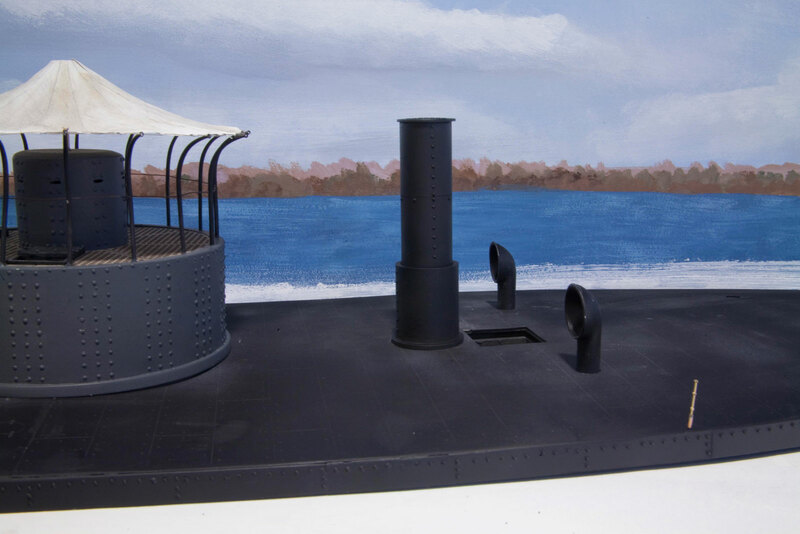 Later, for the Canonicus class, the gun ports were enlarged to eliminate the smoke box and the 15-inch guns were redesigned with a 16-inch long muzzle. Canonicus and her sisters carried two 15-inch guns in their turrets. 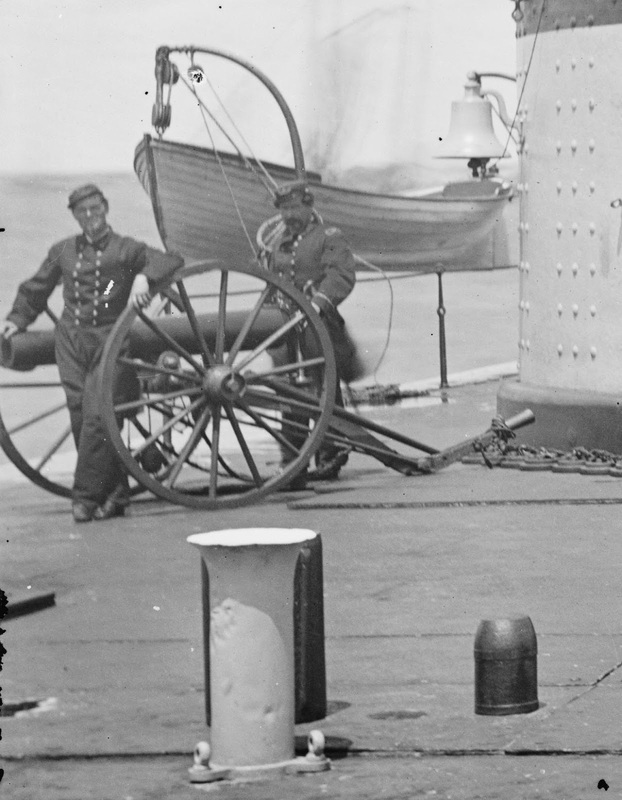 Normally, the crew for firing the 15-inch gun consisted of 14 men, but often only eight men were preferred as being equally efficient with less crowding. Three type of projectile were provided, and the 440-pound solid shot could be fired with 60-pound charges at close quarters, although 50 pounds was the normal charge. Cored shot of 400 pounds was recommended for use against masonry. The 330-pound shell contained 13 pounds of powder and was ordinarily fired with a 35-pound charge. 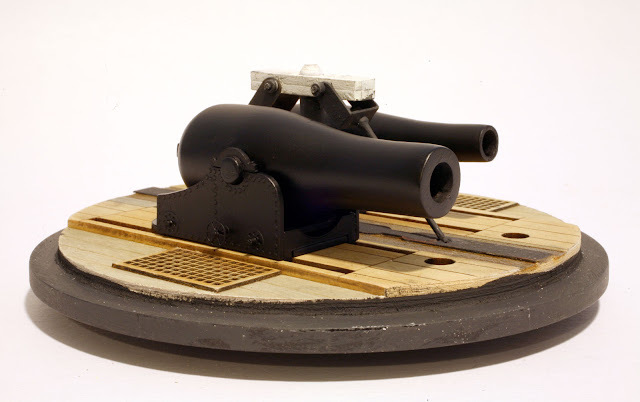 It contained three navy time fuses of 3 1/2, 5, and 7 seconds.Final justification for the 15-inch gun came on June 17, 1863 when Weehawken’s cored shot penetrated Atlanta’s 4-inch armor plating and broke the heavy iron casting at the top of the pilot house. Surrender occurred after only 15 minutes of fighting.In addition to the heavy smoothbores, a few of the monitors were equipped with the 8-inch 150-pdr. Parrott rifles. Of the Passaic class, Lehigh and Patapsco had them in place of the 11-inch shell guns, and finally the 11-inch of Passaic was replaced with a 150-pdr. rifle. The twin-turreted Onondaga also had a 150-pdr. Parrott alongside the 15-inch smoothbore in each turret. The extra range of the rifles was occasionally useful in reaching targets unattainable with the smoothbore. I am just about finished with the main guns for the Passaic. She had two Dahlgren guns in the turret, a XV-Inch Short and an XI Inch. While the two guns were about the same length, the XV inch gun weighed nearly three times the XI-Inch. 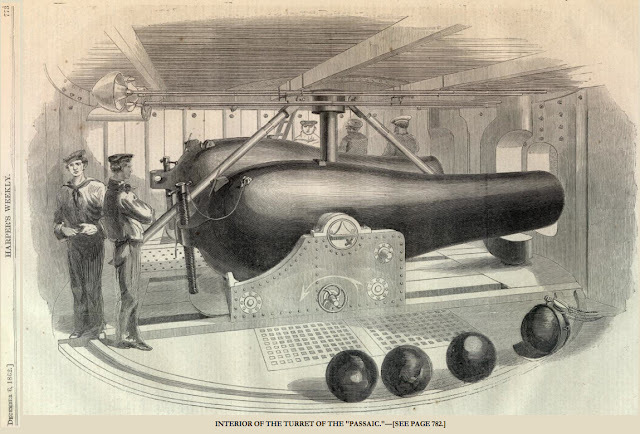 The XV-Inch gun weighed 42,000 pounds - that's 21 tons! It fired a 440 pound shot using a 35 pound charge. To make the guns, I drew the cannons as a set of 1/8th inch slices. Then I laser cut the slices and glued them in sequence on a 1/4 inch dowel. Then using my drill as a lathe, I smoothed the surface of the guns using Elmers wood putty to fill in gaps. The carriages are also laser cut from 1/16th acrylic. I used styrene rod and phosphor bronze wire to detail them. The laser did all the hard work of the rivets and flange detail. The hand wheel for the recoil brake is a part from my photo etched freight car set. 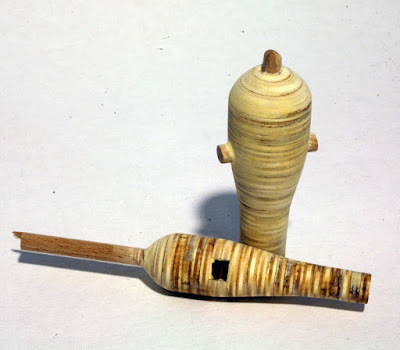 The trunnions are sections of 1/4 inch dowels that fit into the square holes that were laser cut into the sides of the appropriate slice. There are some additional details I plan to add such as the gun block and tackle, elevation screws, the gun port stoppers, ammo racks and smoke box. I need to revise the base as the XI gun is too far to the outside. I also need to revise the hatches in the turret as I forgot to leave room for the ammo racks. I plan to glue the pilot house to the turret so it can support the awning. But the whole turret will be able to be lifted off to see the gun details. Designing the turret to be removable required some compromises in how I attached the truss rods. In the end I have them attached to the turret floor. It is hard to see the interior with the turret and roof installed. I revised the turret based on the most recent information I had. Relying on Alvah Hunter's description, combined with studying the three engineering drawings, plus two artist sketches of the turret interior of Passaic and Montauk, plus some educated guess I arrived at the following turret roof configuration. All the parts were laser cut. None of the references were entirely consistent, so I had to make some decisions. The turret frames are 1/8th inch plywood. 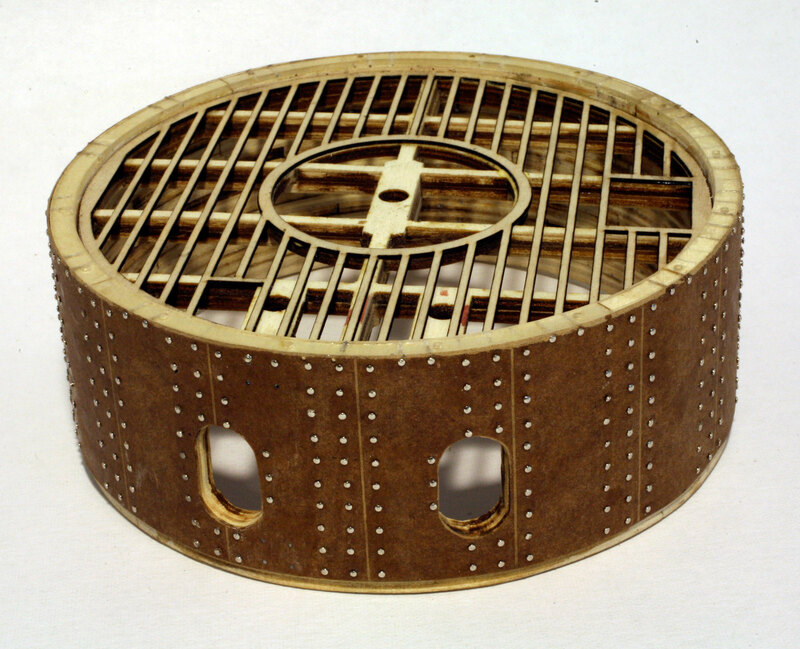 The simulated iron rails and the wood grating are laser cut 1/32nd inch plywood. The perforated iron plate is laser cut resin impregnated backer board. 512 Rivets, each made from a sewing pin, individually trimmed to size and inserted in a drilled hole. Whew! And there are more to go! The turret on its base with the pilot house added. Still lots of detail work to go. 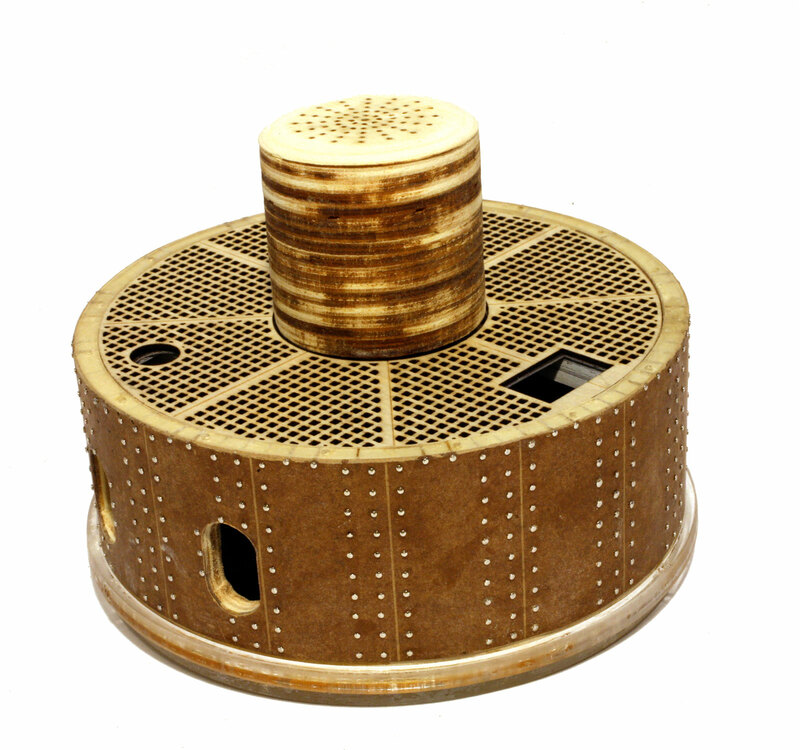 The circular hole is for the smoke box vent. The photo below demonstrates how the turret will be removable to allow one to view the guns and other to be added details. I haven't decided if I want to make the pilot house removable, as it is needed to support the to be built awning. The two holes are for the bottom axles of the armored port hole stoppers. One will be inside the smoke box and not very visible. The turret will be removable to allow viewing of the guns and interior. I have consolidated several drawings of the turret interior that I found on the web below for ease of comparison. I annotated some to note discrepancies or other items of interest. 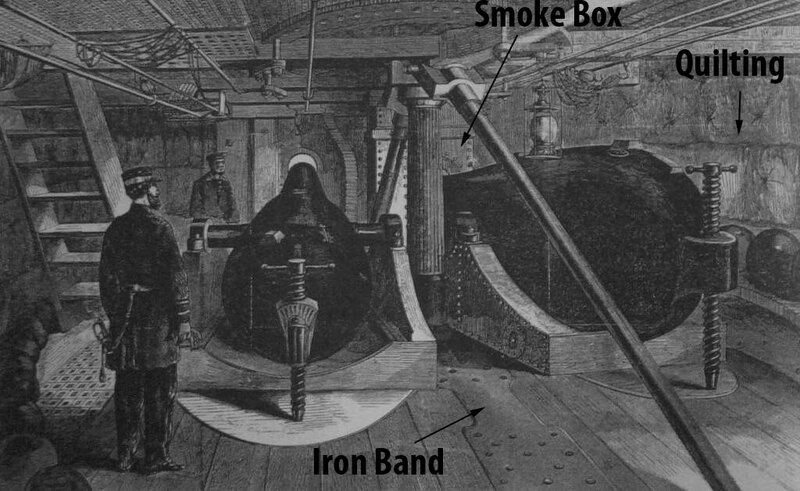 This drawing shows the best view of the smoke box. Note the quilting on the walls and the perforated iron on the roof. 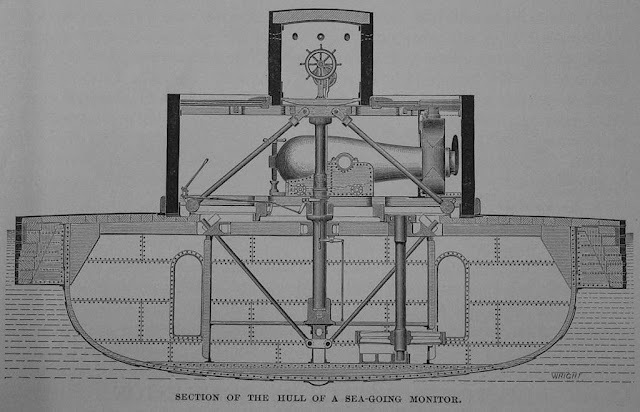 There is no visible ladder to the pilot house in any of these drawings but text descriptions describe a hatch. The ladder was probably removable. Note how the XV inch gun is on different sides of the turret in the various drawings. This view shows gratings leading to the turret chamber below the turret. Note the thin ladder in the background, compared to the stairs in the Montauk drawing. Hunter describes a removable iron ladder. There is no smoke box on this drawing. Both drawings show a bolted ring under the pilot house. 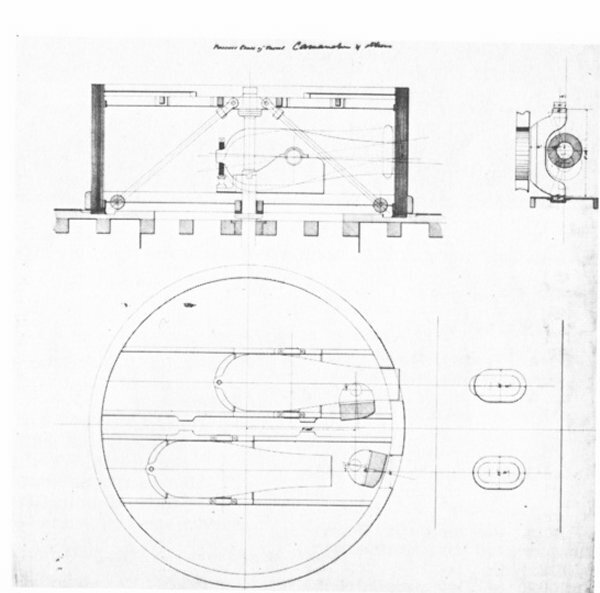 A good engineering drawing showing the port hole stoppers (that are different sizes) and the smoke box. No smoke box in this drawing. Did the Passaic have one or was that a latter addition? Hunter describes how the smoke box was not particularly effective and was damaged by the blast from firing the gun. Here are some questions people have asked about the turret and my answers based on my research. -The engineering drawings show the stack and the vent hole from the stack, but as the turret traverses, it would seem that the stack would be venting into the turret unless the alignment is perfect. How's that work? 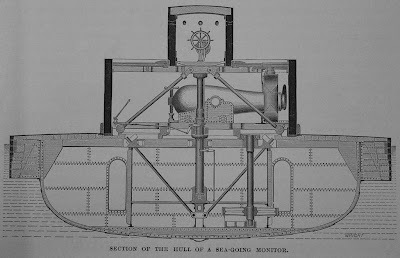 The pilot house was fixed to the hull. The rest of the turret rotated as a single unit. It was actually hydraulically lifted a couple inches to rotate. The turret was supposed to be sealed at the turret-hull base, but the seal leaked, so they caulked the turret when they went to sea. The rails and perforated plate were held in place only by gravity. 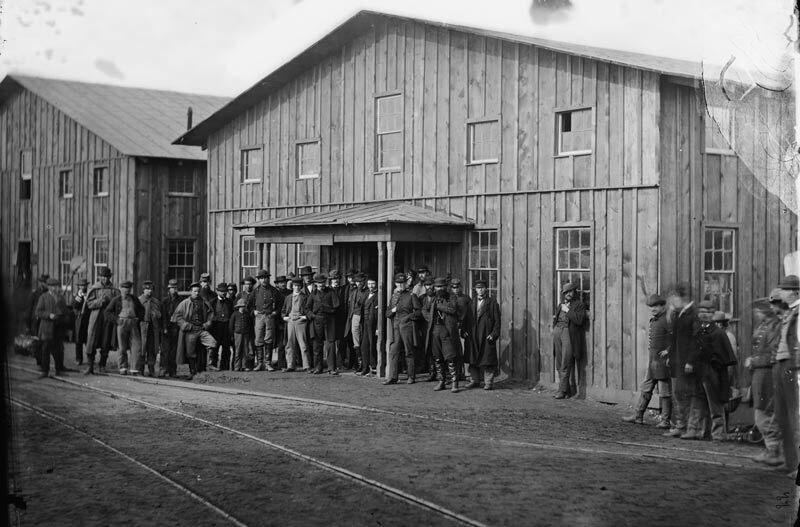 Hunter describes an accident where the plates were knocked loose by an explosion. The iron ladder that was stored on the turret top was blown over board and not recovered in the incident. The turret had wrought iron plates covering the rivets, an early form of spall liner that is currently used on armored vehicles. These prevented incoming shot from sending sheared-off rivets flying around the interior of the turret. However, a pilot was killed in the battle for Charleston when a shell sent a rivet flying in the pilot house, which apparently was not so equipped. There were two blowers in the hull under the turret, in a space they called the turret chamber. These blowers drew air through the ship and out the turret. The hull was water tight during sea movement. They actually sealed the hatches and caulked them as the installed rubber gaskets were ineffective. Later they added hatch and ventilator combings that allowed better air flow through the ship. The XV inch gun actually fired with the muzzle in the turret. It had to be LOUD! -How'd they get into the turret from the deck? And for that matter, how'd they load food, powder, shot and so on? There were removable ladders from the turret chamber into the turret and from the turret to the turret roof. There was a ladder on the external side the turret. When underway or in battle to exit the ship you had to go from the hull to the turret chamber, up a ladder into the turret, up another ladder to the roof and then down the external ladder. They used the turret roof as a quarter deck when underway, as the deck was awash. There were other hatches on the hull deck for loading supplies and ammunition. The ship had a steam condenser to make fresh water. Something didn't look right with the turret armor. Sure enough, I had miscounted the number of armor panels. I had 14 but there were supposed to be 16. So I ripped off the armor wrapper and made a new one. 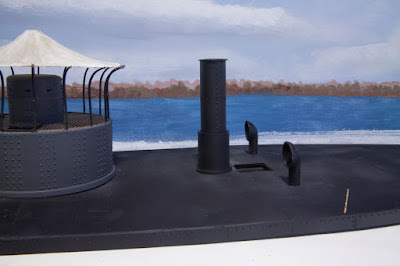 I also decided to redo the turret roof using the same basic design as used on the USS Monitor. The Monitor had railroad rails under perforated plate. This photo shows the Monitor turret under conservation at the Mariner's Museum in Newport News, VA. So while I was at it, I ripped off the roof and made a new one. Since I didn't have any the images of the Passaic turret roof, I am going with this. I think it looks more interesting too. The Passaic was essentially an improved Monitor, so this may even be right. Alvah Hunter describes the railroad rails and perforated iron plate construction in his book, "A Year on a Monitor and the Destruction of Fort Sumter." He also describes wooden gratings over the perforated plate on top of the turret. He mentions removable ladders used to get to the top of the turret, but did not describe how to get into the pilot house. He mentions only one hatch, so I may need to revise my turret roof again. With the correct number of armor panels all the rivet and panels line up correctly. Upside down view showing the simulated rails and beams. The photo aboves shows the gun port inserts that fit in overly large gun port holes in the turret walls. These inserts are laser cut to the same shape as the gunport in the armor. The inserts made lining up the gun port armor and walls much easier as now I do not have to drill the gunport holes through the walls. A little bit of sanding and they where done. Once I add a turret liner, it will hide the wood layers and the gun port inserts. 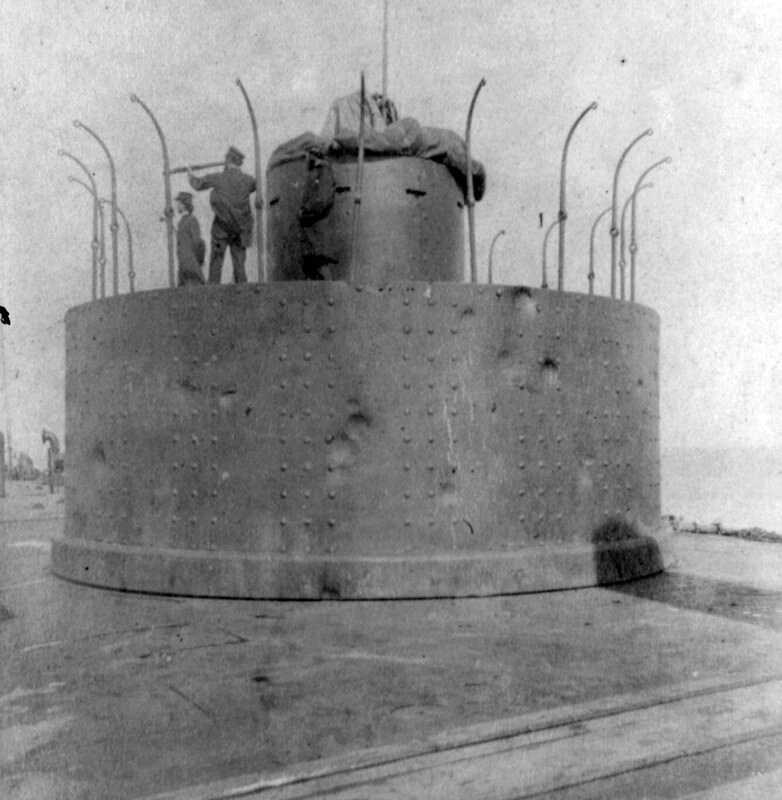 The US Monitors had wrought iron plates covering the rivets in the turret. This design prevented rivet heads from becoming flying missiles if struck and broken off in battle. It was essentially an early form of spall liner a design used on modern armored vehicles. These ironclads were amazing advanced designs. If anyone knows how the crew accessed the pilot house, please let me know. I can see no ladder or access door in any of the photos or drawings. I started adding the armor to the turret. I did not have detail plans for the top deck, but I did find a drawing on the web that showed an assumed arrangement. Using that plus some period drawings of the interior of the ship, I added hatches and gratings to the turret roof. This is mostly an educated guess. If anyone has a better reference, now is the time to make corrections, so please let me know. Anyone know how the pilot and crew got into the pilot house? There doesn't appear to be a ladder inside. The armor plating is a layer of 0.015 inch resin impregnated backer board with laser cut holes for the rivets. The rivets are fine dress maker pins that have heads that scale to 2.5 inches, the scale size. Once the armor plating was glued to the turret, I drilled out each hole with a 0.030 inch drill. Then I have to trim a pin and insert in every hole. That should take another fun few hours. 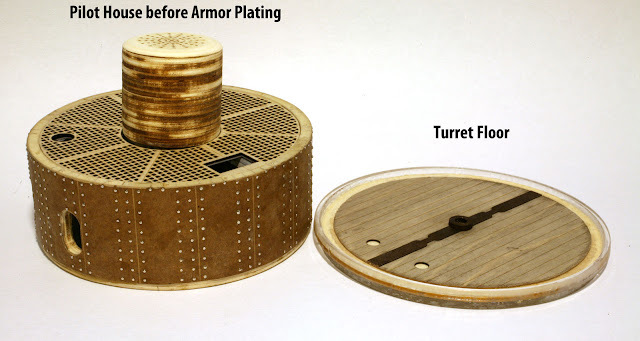 I decided to cover the gun ports opening I made in the wood turret wall with the armor plating as they did not line up with the gun ports that I cut in the armor. I'll drill out and file the wood for the gun ports once all the rivets are installed. The pilot house is a cap from a can of Testors Dullcote. It is almost the right size. I'll make the final one using the same technique I used for the main turret. The awning supports for the top of the turret are davits from Bluejacket. They are almost a perfect match. The turret walls lift off the base, so if I decide to detail the interior it is possible, but without better information, it would be difficult. Work continues on the USS Passaic. The task board surface on the hull texture was not as good as I hoped after I painted it, so I laser cut a fresh layer of hull plating using resin impregnated paper. It has a smoother texture that is closer to scale. I started building the turret using a series of laser cut rings and discs. Next I will add the armor plating and rivets. The turret armor plating will be also made with resin impregnated paper. I will use sewing pins for the rivets as I found some that were the correct size and shape. I do not plan to add extensive detailing on the turret interior as I don't have great references. So the interior will be pretty basic. While the laser was cutting turret parts I added a base coat of scenery to the Stoneman's Station area all the way to Potomac Creek. I now have at least base scenery from Potomac Creek all the way to the end of the line at Falmouth. It is curious but with just the base scenery, the layout looks smaller. I need to add some view blocking features to break up the line of sight and add some visual complexity. Base scenery at Stoneman's Station. The tents are just placed for planning purposes. They are not in their final position. There will be an extensive supply depot here. Looking from Potomac Creek to Stoneman's Station. What is that object hiding under the Model Railroader back issues? 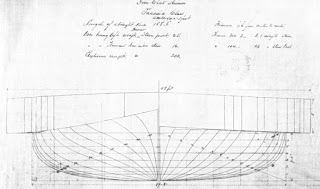 Why it is the beginning of the hull form for the USN Passaic. I had mentioned that this ironclad was in the upper Potomac in the winter 1862. It was towed to Washington, DC Navy Yard for repairs. Presumably it sailed back south under its own power. Did it stop at Aquia for a brief visit? Unlikely, but possible. After much prodding from Gerry and Rob, I decided to at least try the USN Passiac at the wharf scene. I mocked it up with a piece of cardboard painted dark brown. It looked tight, but it could work. Brian K. suggested making it sub-scale, but with it being in the foreground, I decided against that. I started building the model using a standard ship modeling technique of plank on bulkhead following plans I found on line. I used a straight pine 1x2 as the center keel for stiffness. I was laser cutting the bulkhead parts. Thus I had to make the longitudinal bulkheads in three lengths as my laser bed is 18 inches long, but the ship is 50 inches long. As I built the frame I realized that it was riding too high. I was building the armored hull to scale height (see plans). 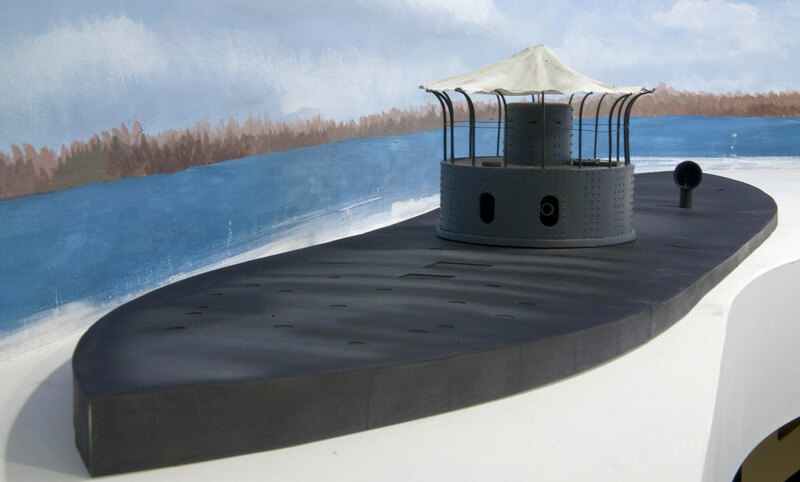 But when I re-examined the plans I noticed that the freeboard (the part sticking out of the water) was only about 12 inches, or a quarter inch in scale. There wasn't any practical way to cut down the bulkhead frame. 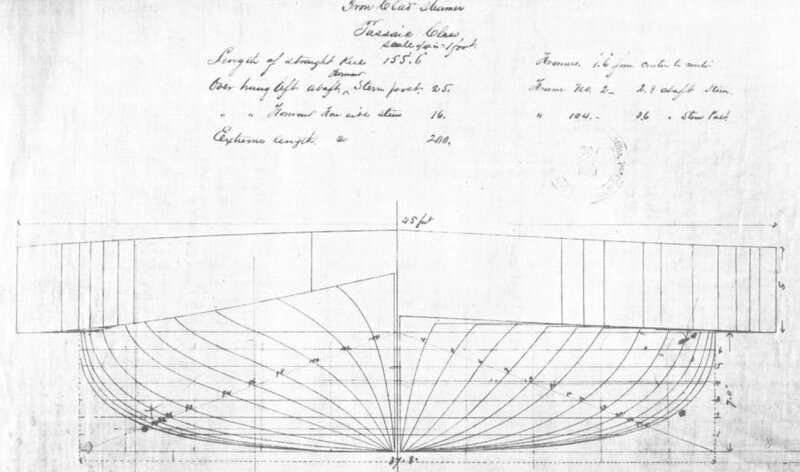 A much simpler approach for the hull would suffice. So I trashed the bulkhead frame and used the laser cut a layer cake style model using 4 layers of 1/16th inch thick task board. The top layer was engraved with the armor plate and rivet detail and had the appropriate holes cut for portholes, turret, stacks, etc. I glued the layers together and by the next morning, I had the makings of an iron clad. I attempted to depict the hull camber using spacers under the top layer of task board. I probably should have put the spacers under the bottom layer to get the profile more accurate. There is also some sheer to the hull. Most photos show the ship riding lower at the stern than at the bow. I am thinking about how to show this, even though the effect is subtle. I had earlier done a test of the task board to see how it would appear when painted to resemble iron armor. I was very pleased with the texture. As an alternate, I may try cutting some sheets of resin impregnated back board as the armor surface. I may do a new version using a single piece of 1/4 inch plywood as the base and then add small pieces of laser cut profile boards to simulate the camber. It depends on how the task board hull holds up to detailing and painting. I am a little concerned that it might warp. One solution would be to secure it to the table surface with screws to hold it steady and prevent warping. I prefer not to glue it in place in case I need to move it if I change my mind. The photo below shows a mock up of a possible configuration of the scene with the USN Passaic. By angling the wharf on the peninsula and moving the paddlewheel steamer into the resulting wider section of water closer to shore, I have ample room for both big ships. Smaller ships can fill in the other odd water areas. I want to leave space at the end of the wharf for the car floats. I think the scene looks better on an angle too. This is looking good, but is not a sure thing. It is amazing how close the roll of duct tape is to the size of the 1/48th scale Passaic turret. With all the bench work, track laying, electrical gremlins, freight cars and trucks, and now you tell me I have to tell a story too? OK just kidding. Isn’t model railroading a diverse hobby! One of the aspects I like about the O scale compared to my earlier forays in smaller scales is the larger figures allow one to tell a story. I am designing small mini scenes throughout the layout to tell the big picture. Too many layouts approach the detailing stage without a clear story. I think you need to leave "blank" space between scenes to better frame the story. Another point occurred to me as I model the USMRR in occupied territory. To some extent I get short-changed in my ability to incorporate some of the normal everyday events of bucolic life. Since the civilian population has largely fled the area I model, what is left is akin to swarm of locusts trying to augment their army rations with local plunder. This point really came to me when I visited Thom Radice's layout and saw many more trappings of regular life modeled on his layout, things like farms and busy town scenes. Even female figures would be rare in my layout, though the ones I do depict will have interesting stories. For example, this family of freed slaves heading north at Falmouth. I built another house car. It was actually one of the first chassis I had started, but set it aside. It wasn't in bad shape, so I decided to finish it. The decals on this model were a real problem. I had to sand some of them off and try again. In the end I resorted to heavy weathering to disguise the decal glitches. When is that bottle of Future Floor Wax going to get here? You guys that can just go buy your freight car trucks and pop them on the car are so lucky. It takes me about 4 hours to build my trucks (albeit with working brakes). Multiply by 60 cars. On second thought, I'd rather not think that far ahead, at least not from that perspective. Time for a new project. What should be it.....? Over the past few days I added another, and new type, of freight car to the fleet. This is a 28 foot ventilated box car, also called a combination box car. I based it on the Illinois Central car depicted in White's Freight Car book. I already offer this car as a kit in HO, so it was not too hard to upscale it to O Scale. I elected to decal it as a USMRR car. I made the decals on my printer and clear decal film. This car has working brakes on wood beam trucks. After I took this pictures I realized I forgot to add the stirrups at the bottom of the ladders. I have since added them. Now that I have a few freight cars, I've been doing more test operating. I have noticed that when backing cuts of cars, the pushing forces are sometimes are causing my cars to derail. As I study what is happening I see that the coupler offset on "S" curves (such as when taking the diverging route on a turnout) is causing a strong sideways force on the cars. It can actually lift the car off the track and cause a derailment. John Armstrong called this "lurching" and he developed a phrase called the "coefficient of lurch." My links and drawheads are causing a high coefficient of lurch. The photo at the right shows the lurch, or offset I am getting. The problem comes when the link hits the backing plate inside the drawhead. I designed the drawhead with this backing plate as I thought I would need it to keep the link from sliding too far into the draw head. I actually have to solder in a separate piece for this plate. It is a simple matter to leave off the plate. I built some drawheads without the plate and did a test. Sure enough, the cars back up much more reliably without the plate. Without the plates the link can slide completely into the drawheads when the cars are being pushed. 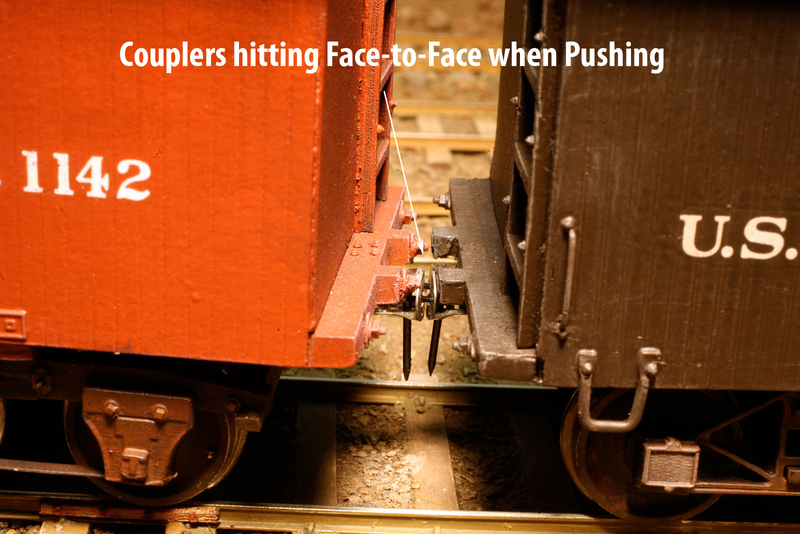 This allows the two drawheads to strike face-to-face. This reduces the lurch as it allows the cars to come closer together. It also reduces the sideways force on the cars. The cars pull normally. Without the plate it is a bit harder to get the link positioned in the drawhead as they can now slide all the way in and slightly sideways, but this is not bad and worth the improved reliability. Now I need to retrofit the rest of the couplers and remove the backing plates. I did some more testing and determined that shorter links also work well. I can make up a batch of shorter links using brass wire. This will allow me to avoid retrofitting existing drawheads. The tool shed has a home. I added a removable roof to make the interior detailing more obvious. I also added a second window to let in more light. I think it fits in pretty well in this spot. I had to move one of the chevaux de frise to make room for the building. For the bare spot in front, I added a detail of soldiers heading to guard posts along the entrenchments. The figures have small 0.032 inch pins in their feet, so they are easy to move around for different views. Note the artillery men in the background are now in their final positions. They do not have pins. They are just glued down. fascia helps blend it in with the scenery.